Fortunately, we can always confirm that the altitude is hardly ever a problem for our Spanish students*. We do recommend all our students to rest upon arrival, and take it easy during the first days so your body can adjust to the altitude before their start their Spanish classes in Cusco. But does really happen in our body, when we arrive at the altitude in Cusco? Why do we react to altitude changes? With each breath, you inhale a certain amount of oxygen. Your body is accustomed to this respective amount. If you change your position to a significantly higher elevation (2500m or more), you will most likely show symptoms of altitude sickness. Why? In higher elevations, the air pressure is less. This means that although the oxygen percentage in the air stays the same, you will still take in less oxygen with every breath you take because the air is less dense, or “thinner”. The term “sickness” implies that there is a cure for it. However, there isn’t. Practically the only cure would be to return to lower levels of altitude. You can, however, treat the individual symptoms. Not everyone shows symptoms in the same manner, and not everyone is affected by altitude sickness in the first place. Should you really feel bad and should your symptoms not lessen after 72 hours, you should consider getting yourself to a lower altitude. In any case, consult a doctor, especially if you suffer from lung or heart problems! AMAUTA is happy to count with an in-house medical assistance: there is a doctor available for you 24 hours a day. In case you want to travel to a lower altitude, you can consider spend a week at our Spanish school in the Sacred Valley of the Incas, which is almost 1000 meters lower than Cusco. What can you do to lessen the effects of altitude sickness? As mentioned, you are used to a certain oxygen level. Changing this requires you to adapt, and it´s best not to put more stress on your system. Don’t do hikes or any types of work outs on the first days in a higher elevation. It will also help to take deep breaths. Altitude sickness is hard to differentiate from dehydration. In any case, provide your body with lots of water to properly hydrate and support it while acclimating to the different oxygen level. 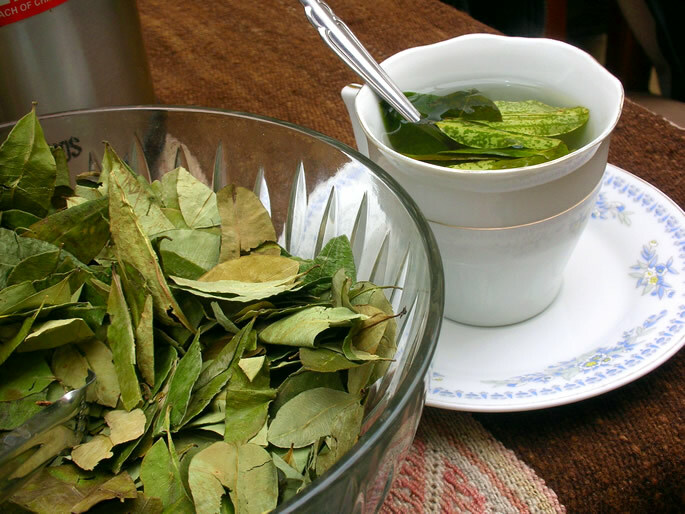 Besides water, there are many Peruvian herb teas that are a nice alternative to water: mate de manzanilla, mate de anis, mate de coca.. Indeed, that’s coca tea. Drinking alcohol will put additional strain on your body. As mentioned above, you might want to give yourself some rest during the first days of acclimation. Studies also show that alcohol has a stronger effect in higher altitudes. This means that you will get drunk faster than you are used to, so it´s important to be careful. Take baby steps to higher levels. If possible, ascend slowly to places of higher altitude. If possible, travel by bus or car instead of by plane in order to adjust day by day. If on a hiking trip, it is important not to climb more than 1000 meters per day. Take medicine to reduce the symptoms. Pharmacies do offer medicine against altitude sickness. Once you identify your symptoms, you can find medicine to minimize the discomfort. Consult a local doctor and get oxygen supplements. As mentioned, not everyone reacts to altitude the same way. Some people show strong symptoms, whereas others suffer less or not at all. In severe cases, however, you should consider seeking a doctor to receive more oxygen through a tank. When you take into account those tips, you should feel perfectly fine when starting your Spanish lessons in Peru! For more info, feel free to contact one of our course counselors at any moment. *This blog is not professional medical advice. Consult a doctor if you have any doubts concerning your reaction to higher altitudes.